The Mexico REDD+ (M-REDD) Program is a six-year project, funded by USAID, that aims at strengthening Mexico’s preparation and implementation of the national REDD+ strategy by expanding its institutional and technical capacity, giving input on financial architecture, establishing systems, piloting diverse elements of the implementation of the REDD+ mechanism—including Measurement, Reporting and Verification (MRV) techniques—and contributing to the facilitation of the dialogue and broader public participation and transparency in the REDD+ process. Importantly, M-REDD has integrated a gender perspective from its start and implements gender-responsive strategies, including using REDD+ as an opportunity to enhance implementation of national mandates for advancing gender equality and ensuring women’s participation in REDD+ processes. The project endeavors to mainstream gender through its integration in national REDD+ public policy processes and piloting tools in field projects. This is being done by identifying tools that can make the role of women in different field activities more explicit and can be applied at different stages of implementation of field projects, such as silvopastoral ranching and conservation agriculture, in order to promote gender equality in people’s daily activities. With its recent extension, M-REDD will conclude in 2017. 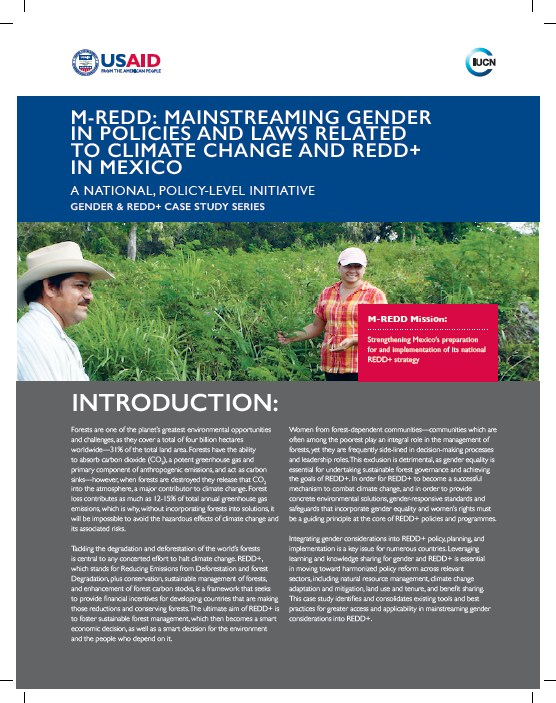 This case study highlights strategies for ensuring that gender considerations are understood at a national level and progressively taken into account in Mexico’s REDD+ legal and policy framework.